Sometimes in life, you have these unexpected moments, pure, unchallenged, life altering moment that you remember forever…. That no matter the years you can always look back on and remember as vividly as when they happen! A moment you can re-live and re-experience whenever you chose and bath in its absolute uniqueness ..Something so great its hard to reconcile the reality? You think “Did that really just happen??? Do you get these? I haven’t had many ..Which I guess is something that makes them so special! For me they have been as simple as attending the Vienna Opera for less than the price of a cup of coffee or marvelling at Rio de Janeiro from above to spotting wild tigers in India at sunset and diving with Manta Rays in the Komodo Islands … These moments of pure, unadulterated perfection punctuate the travel spectrum for me, and remind me why I love to do what I do …No matter that frustration it causes!! Look at this little guy, so inquisitive .. Absolutely amazing! I had one such moment on a recent trip to the Galápagos, courtesy of G Adventures, where within a few hours of landing on San Cristóbal Island I was snorkeling an a clear blue cove surrounded by rugged volcanic cliffs and turtles popping their heads up for air…Lots of Galápagos sea lions were sun-bathing and relaxing not a care in the world…Most of the group had decided to get out, I was close but then suddenly this little sea-lion cub swam up to me and started showing off…like REALLY showing off. 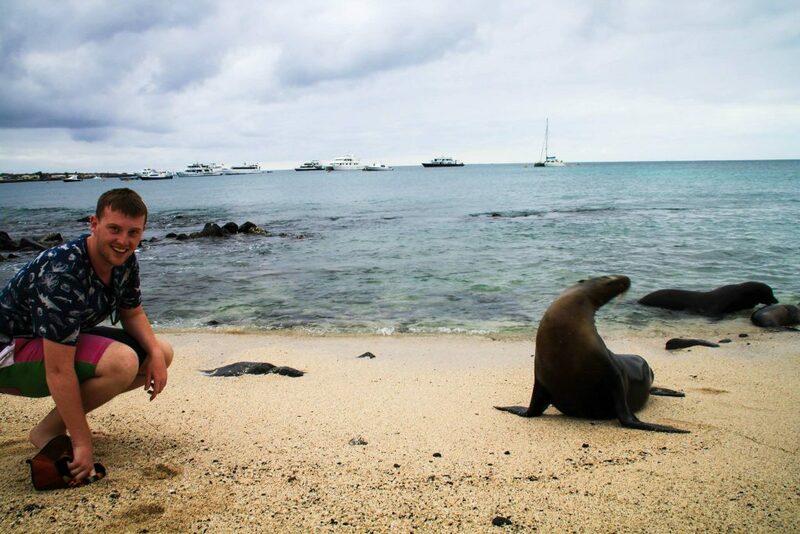 In the Galápagos its really important to keep a 2 meter rule and not to affect the wildlife’s natural behaviour – A rule of thumb is they notice your presence, you’re too close…. But I think the only creature that doesn’t abide by this rule is a baby sea-lion – because after a half hour of playing with this guy I am of no doubt that they crave human attention, like to play with us and are pretty much reaping the benefits of their “sea celebrity-ness”.. 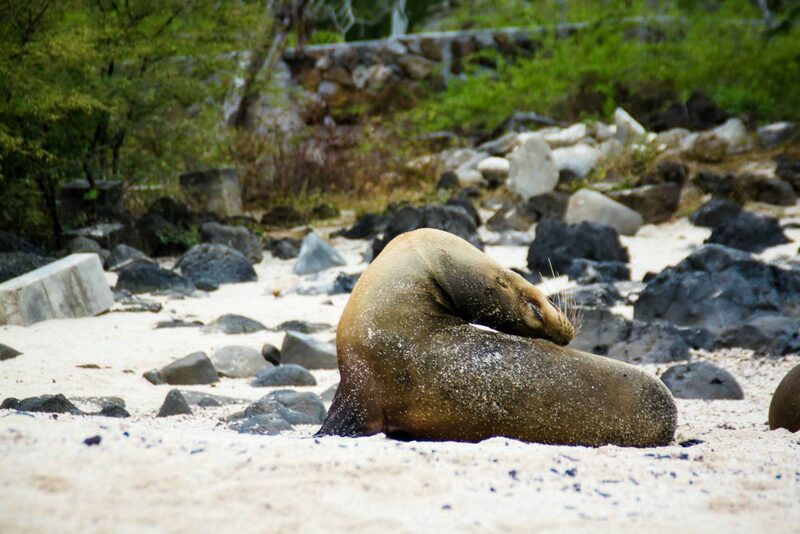 Yes, Galápagos sea lion are not only cute but very flexible! He must have thought I looked weird… Thinking hmmm maybe if I look at him upside down, nope still don’t get it! To be honest the below video doesn’t even do it justice – The calm cove, the sun on my back, the calm as I remained submerged in a interaction with wild without any artificial pre-text, no zoo encounter or wildlife park. This was the real deal! I have always thought sea lions are like the dogs of the sea, but they are more mischievous I think, their uncanny ability to barrel straight at you and turn around at the last possible moment, diving, twisting and shooting straight up narrowly avoiding everything in between. 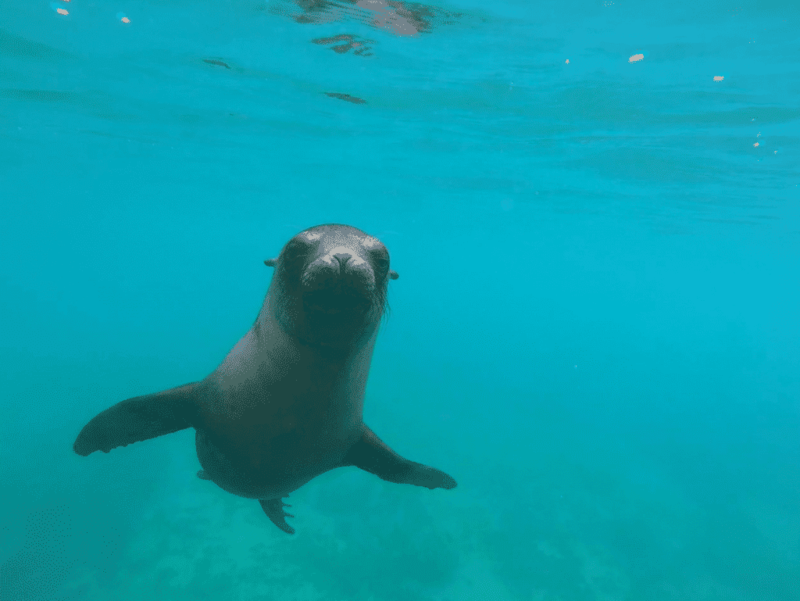 How could you not want your own Galápagos sea lion experience! I was in love. I was enamored…After awhile I decided to pull out my GoPro to film it, then I put it away again to truly enjoy to be in the moment. 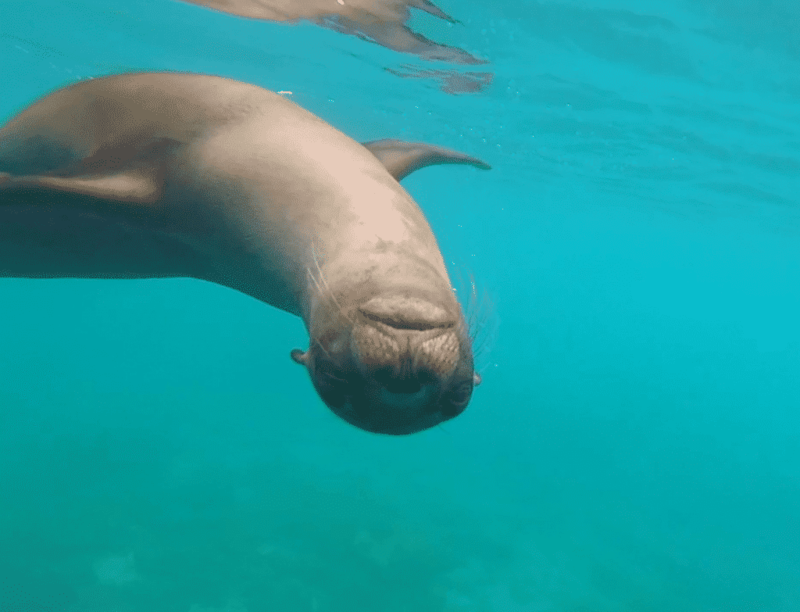 And while I love the memories this video brings to me, it all in my head – I will never forget this guy and the majestic of the Galápagos…And now you can see it for yourself here! P.S. 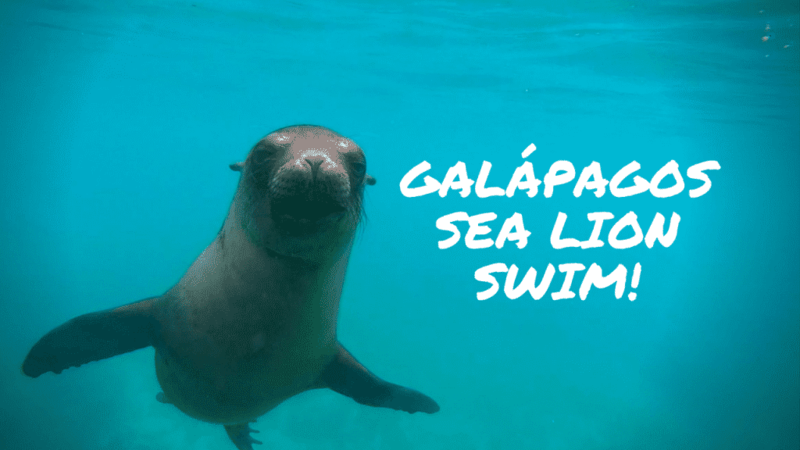 If you don’t have the time to get to the Galápagos you can also try checking out Isla De La Plata Ecuador and an alternative to the Galapagos, or Swimming with Sea Lions in Lima (Peru)! 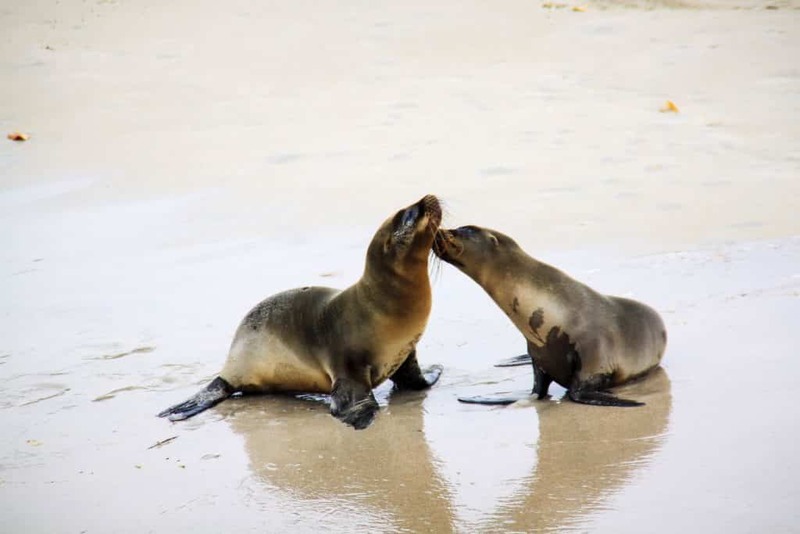 Have you experienced something like these amazing Galápagos sea lions? 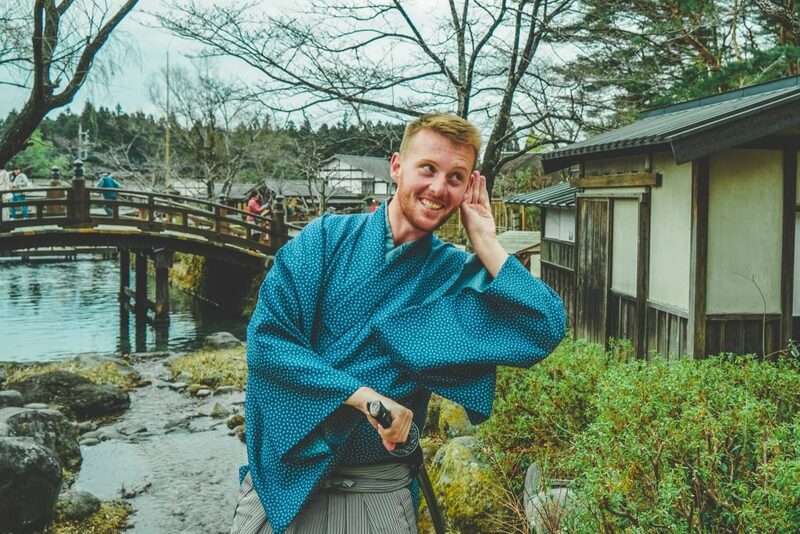 A travel memory that jumps out about all else and makes you feel all warm-and-fuzzy inside when you think about it? Let me know in the comments below!